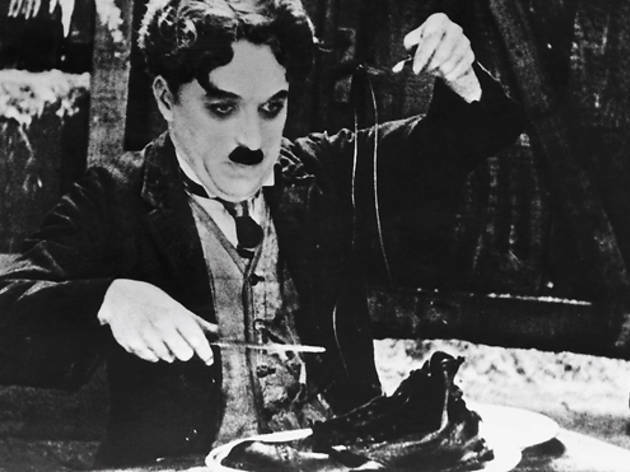 Before Werner Herzog ate his shoe, there was a certain Lone Prospector (Chaplin) trapped in a snowbound cabin during the Klondike gold rush, stomach growling and a boiled boot---with a side of shoestring spaghetti---the only option for sustenance. What's a Little Tramp to do in this punishing environment but make the best of things? He chows down on the soggy footwear with all the aplomb he can muster, leaving the looks of disgust to his bear of a best friend, Big Jim McKay (Swain), who later has visions of Chaplin's iconic character as a giant chicken ripe for the plucking. This greatest of silent comedies could be subtitled "Hunger"---not just for a decent meal, but for financial stability, for the love of a good woman and for a house that isn't perched precariously on the edge of a cliff. 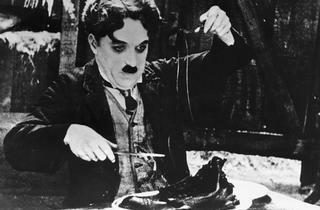 Pointedly, the only time Chaplin plays with his food (the famous dinner-roll dance) is in a dream. Reality is a harsh mistress, as the Prospector-Tramp discovers when he falls for a saloon girl, Georgia (Hale), who won't give him the time of day. This is the original 1925 cut of the film---a reedited, inferior version was released in 1942---so the Tramp-Georgia relationship is much more astringent, even in its deceptively sentimental resolution. Per Chaplin, The Gold Rush is "the picture I want to be remembered by." We'll happily oblige.